According to an almost five-year-old, Bowser is the best! Last week I had the pleasure of caring for Vincent and his sister all day. His parents needed help and I was more than happy to give them a helping hand. Plus, I just love these kids! My little surrogate Grand kids! Many might think that would be pure lunacy, but it wasn't. I will say I was exhausted that night! With no prompting what so ever, Vincent confirmed that his favorite character was Bowser. I was relieved to hear that since his quilt was completely finished. I'm pretty sure I wouldn't have freaked if he said something different since kids usually say something different every time you ask. For now we're on the same page and I'm going with it! 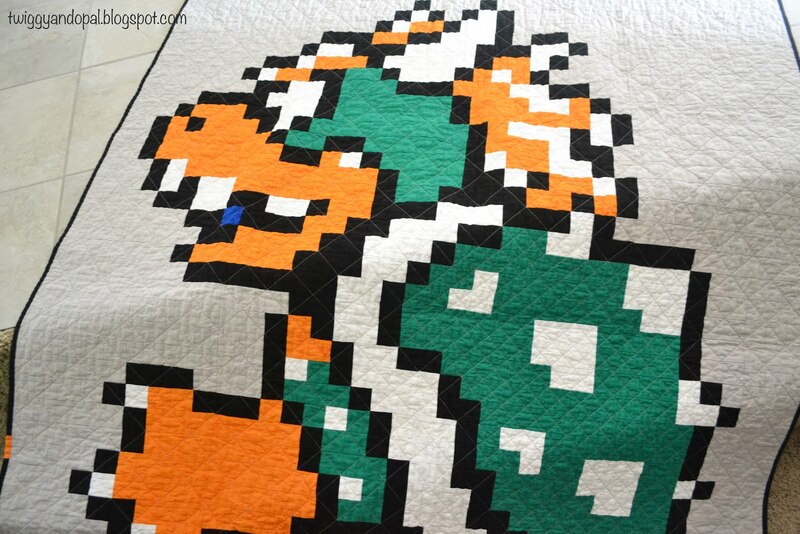 In the last post 'WOWzer Bowser :: Pixelated Lunacy', I was considering my quilting options. 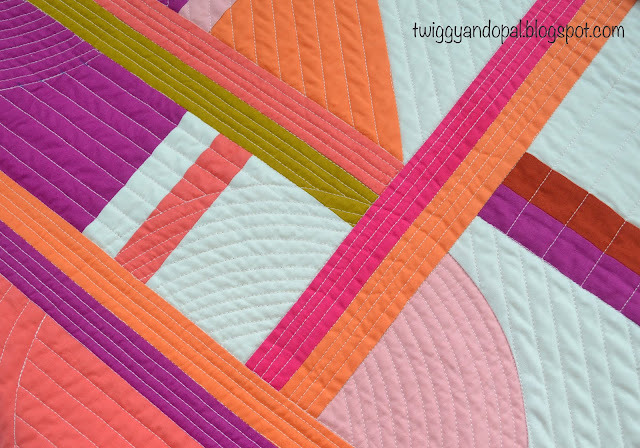 All over quilting, diagonal quilting or in the ditch. The last is not my favorite ever so I was able to rule that out pretty quickly. I ended up going with diagonal lines. 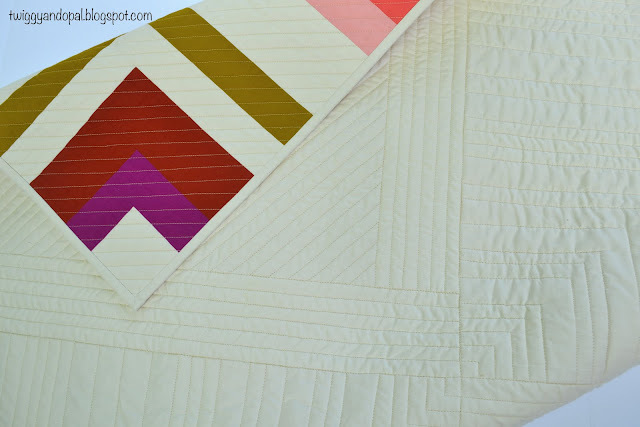 Keeping it simple was the right thing to do for this type of quilt. Plus, it should hold up to an active child and plenty of washing! I did add additional diagonal lines in Bowsers shell which ended up being 1" squares. A little texture isn't a bad thing at all! 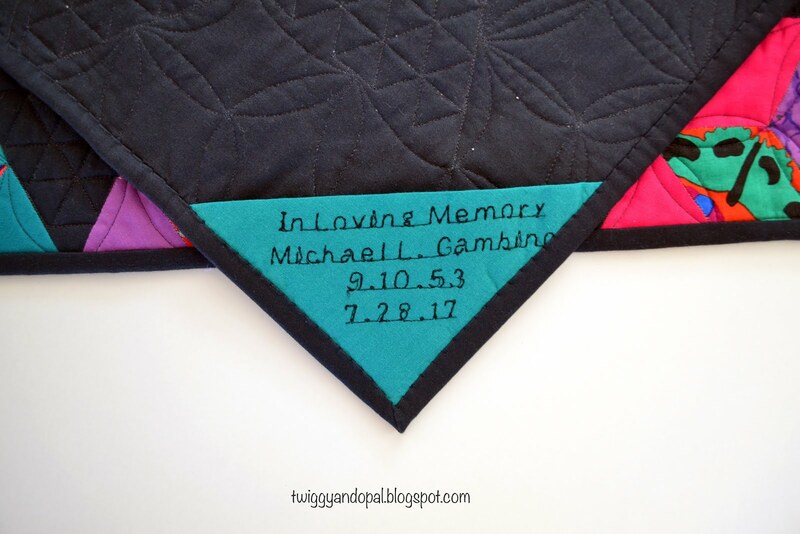 To make the quilt a bit more special, I decided to add his name on the back. There will never be any doubt who this quilt belongs to! It was fun! 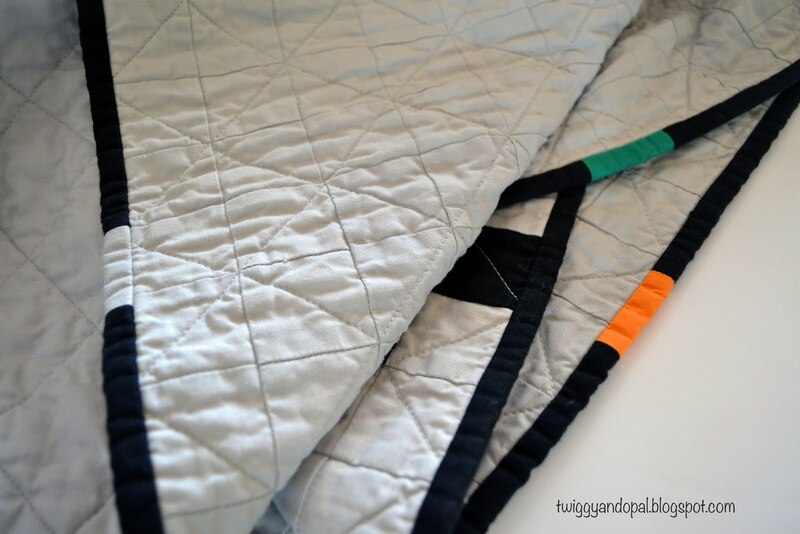 I often add strips to the back of quilts. Sometimes to use up extra blocks, create visual interest or most often because I'm just a little bit short with my backing. Deciding on the binding is sometimes a challenge. I think grey would have made it look unfinished and green is just not my color of choice. Black is another matter! It defines the quilt, contains the image and is the perfect frame...that's what I think! You can always spruce the binding up though! I randomly added 1 1/2" sections in grey, green and orange. It's a nice detail and simple to do. They say 'the devils in the details'! The final detail I added was a label. I know this isn't a beautiful embroidered label, but for a 5-year-old who is getting a life sized favorite Mario character and for his 5th birthday...I think he will not only love it (when he's older), but will think it's perfection! Here's the thing, I'm sure you are wondering what the heck is this 'Lady Jayne' thing. I don't require people to call me that, but if they do who am I to correct them?! Vincent's Dad first started calling me Lady Jayne years and years ago. It has been passed down to Vincent and honestly there is nothing cuter than hearing him say 'Excuse Me Wady Jayne'! Heart melting, right?! Please don't think you have to start calling me that...I'm far from royalty! I'm very happy with this quilt and cannot wait for Vincent to see it in person. However, knowing how kids like to mess with our minds...I'm not going to get to excited about his reaction knowing he most likely will have a toy or two that floats his boat more than a 'quilt'! 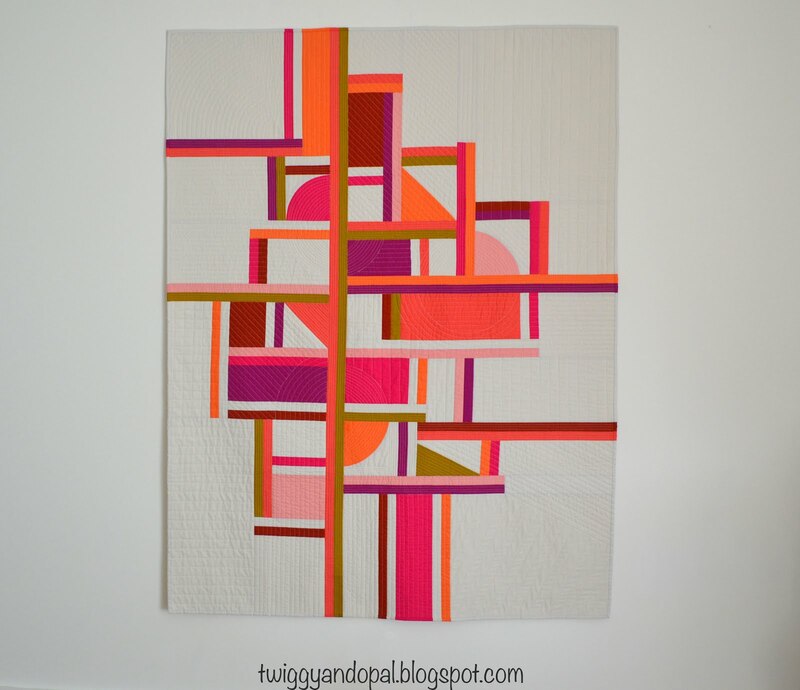 Quilts & More :: Scrap Lab & Cover Girl! 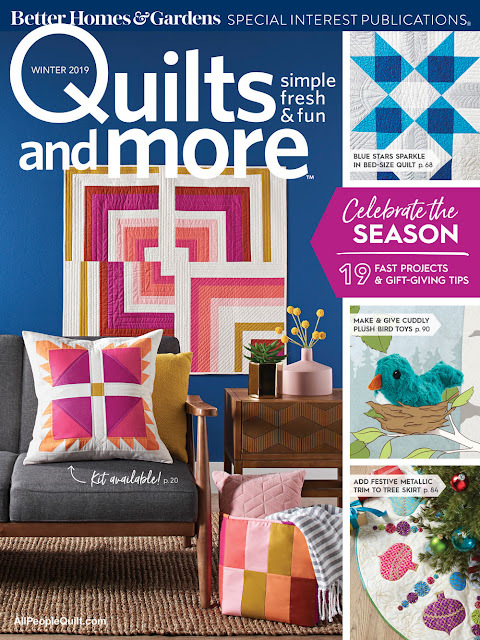 Quilts and More Winter 2019 hits the newsstands today! What makes that newsworthy? I happen to have a project inside those glossy pages and it's on the cover!! Used with permission from Quilts and More™ magazine. ©2019 Meredith Corporation. All rights reserved. I was contacted earlier this year to see if I'd like to be a part of 'Scrap Lab' design challenge. The challenge is for three designers to create a project using one bundle of fat quarters. The other two designers are Jeni Baker and Sherri McConnell who nailed it with their designs! Do those colors look familiar? Not only was I asked to participate in the challenge, but the bundle they picked was my March Madness bundle of "Prosecco & Cream by the Sea'! How about that?! I designed 'Quarter Turn' using 18" half log cabin blocks. The asymmetrical design takes a traditional block and turns it on it's head! My main goal was to show off the beautiful colors and I think I accomplished that. The quilting is simply done using straight lines around three off the blocks and 1/2" diagonal lines in the corner. Simplicity is the best way to go when your on a tight schedule! 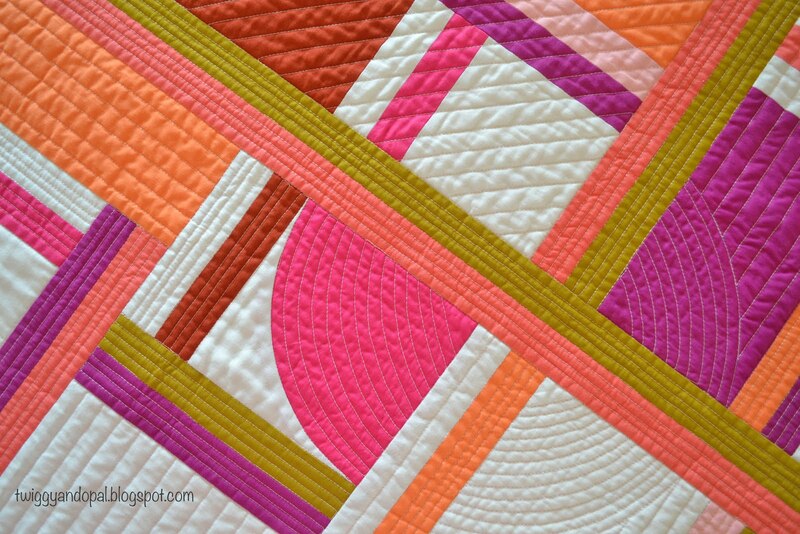 I would have liked to play a little more with the quilting, but I'll save that for the next one! Earlier this summer I had a beautiful Coral Hibiscus blooming and couldn't resist placing the quilt next to it for a photo. If being asked to participate in Scrap Lab and being on the cover wasn't enough to put me over the moon with excitement...this quilt is also going to be displayed at Quilt Market in Houston! If you happen to be attending look for my quilt! I'd love to see how it's displayed! I'm hoping to get my hands on a copy of the magazine! It doesn't happen often that I'm in print, but when it does I get a little excited about it! Getting to the other side of a long process is both rewarding and bittersweet. 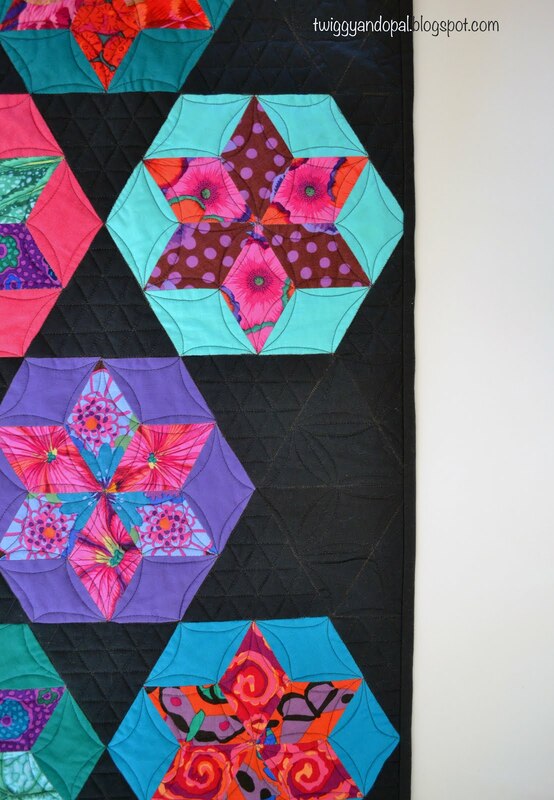 Without going too deep into the details, this quilt took well over a year to finish. 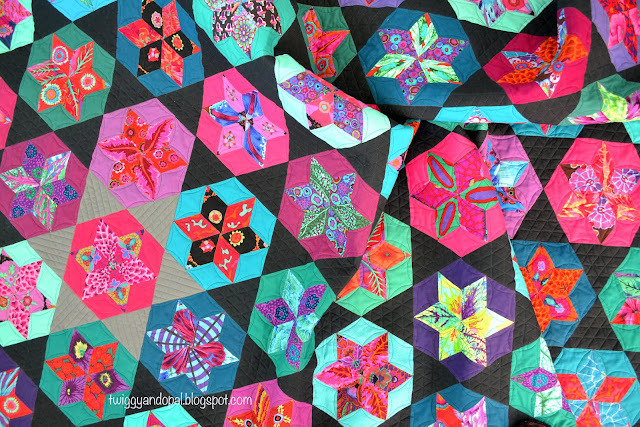 It was a year of real quilt therapy full of happy and sad moments. Hand stitching every single piece was my way of working through what life had thrown me. But let's not go there! It's a happy quilt that I will cherish forever and I'm sure it will bring me only happy thoughts from this day forward! The final piece to the puzzle was the quilting. 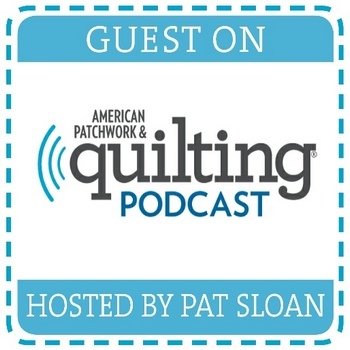 I knew I could never do it justice on my own, so I enlisted the services of Jill Zollinger @sewsouthern_jill who is a member of our guild and a crazy talented long arm quilter. I knew she would nail the quilting so I gave her free reign over the design. My one request was to do a different design in the gray star that represents my brother Michael. Jill added lines in the gray and the black received triangles. 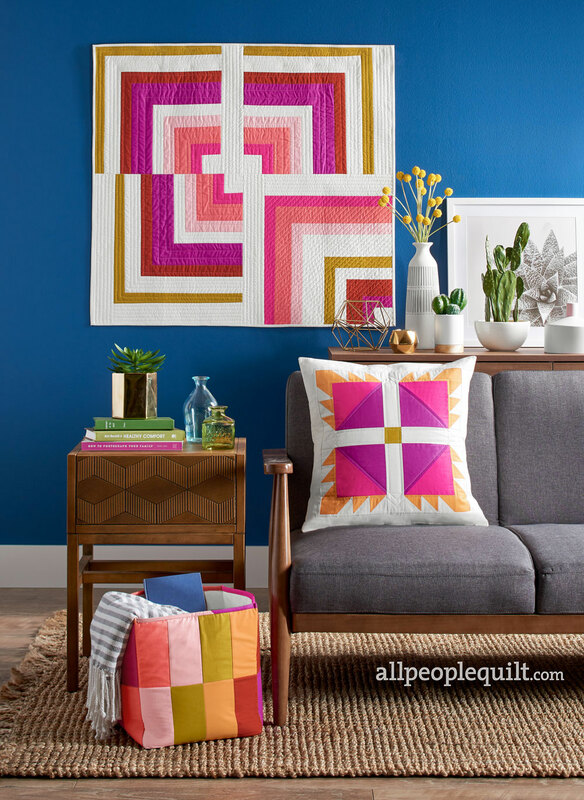 This is a bright and busy quilt! It's so hard to get good clear shots of the quilting when there is black (Kona Pepper) and a saturated busy print such as these Kaffe Fasset fabrics. You'll have to trust me that it's amazing and I love it! I'm so happy that I threw it in a pile on the floor! Actually, the happy part is true and the pile on the floor is a photo shot I just love to take of any quilt! Looking back, I don't think there is anything I'd do differently. It started as just a project to keep my mind occupied and grew into something I never imagined I'd ever do! Who would have thought I'd ever hand stitch a quilt from beginning to end?! The extent of my English Paper piecing projects have been small pieces. A pillow, a wall hanging...but this one was so different. Let's just say I was compelled to keep going...or maybe it's a testament to my need for therapy! The edges had me on edge so to speak! I wasn't sure what to do. I ended up trimming right to the diamond hexies on the sides. The top and bottom starts and ends with a point (triangle) of the star to the edge. I added a corner label using the letter setting on my machine. It isn't perfect like a super fancy embroidery machine would do, but I like it! It's final resting place for the time being is tossed across my couch in a big heap! It will receive the ever important wash and dry for the crinkle effect and it will absolutely be used on a regular basis! 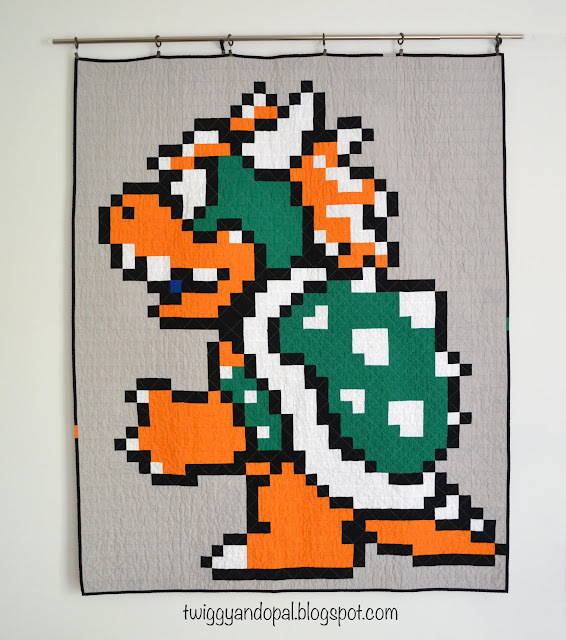 It may have taken a year to complete and fully hand stitched, but that doesn't mean it can't or shouldn't be snuggled under and used! 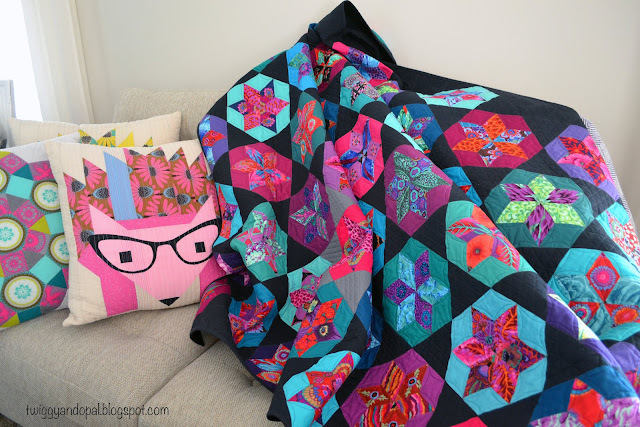 I very much doubt I'll ever make another hand stitched quilt of this size again! Been there, done that rings in my ears! 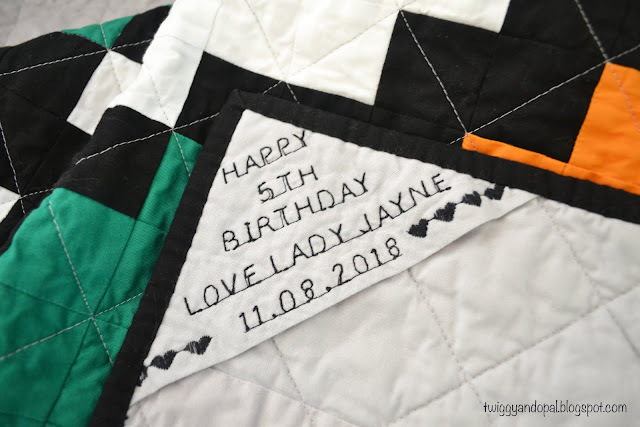 I I love this design so much that I had to make a baby size quilt! But first I had to redesign the original: Geometry Lesson, in order for it to make sense and fit the size. 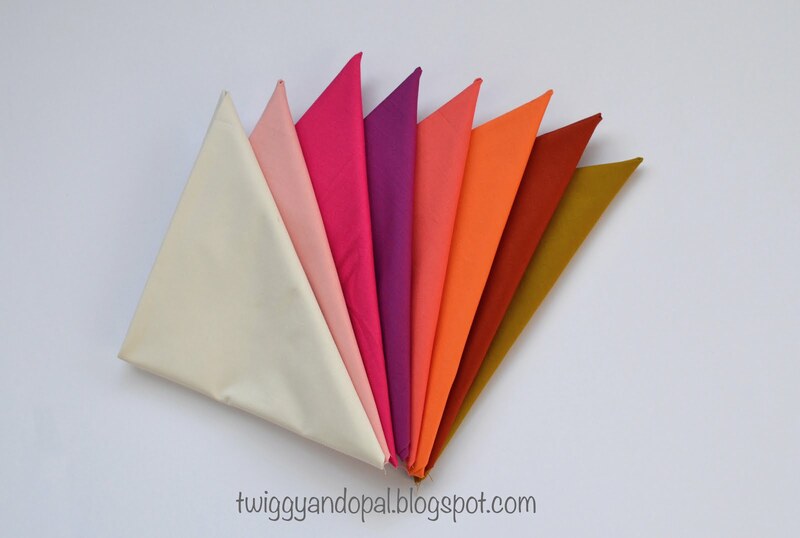 Plus, I got to use different colors and you know how fun that can be! 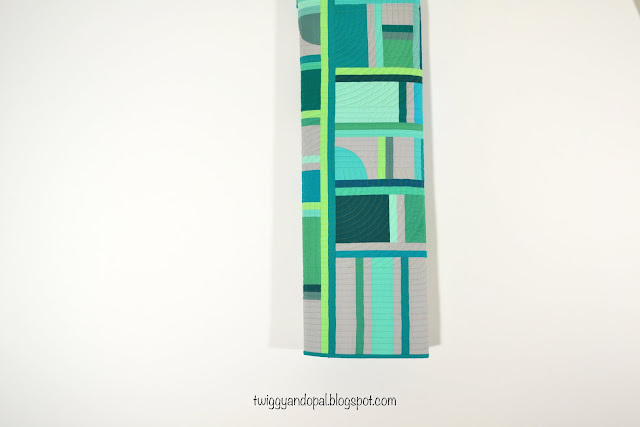 Teal, aqua, pear, turquoise and everything in between! Put it together with a background of Kona Ash and you are sure to have an amazing combination! Jumping right to it, quilting. 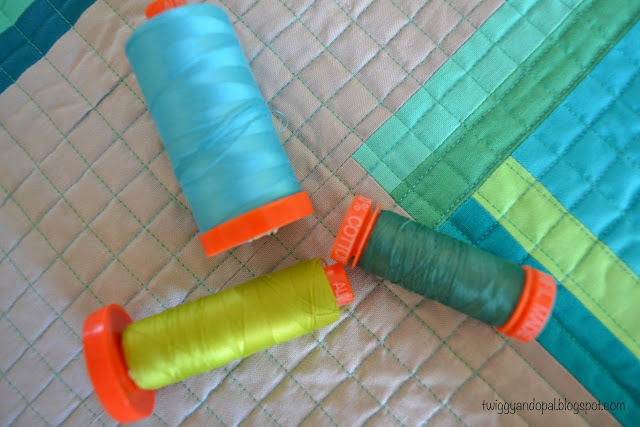 I've learned over the years that quilting can make or break a quilt. Thread matters, or in this case colors. 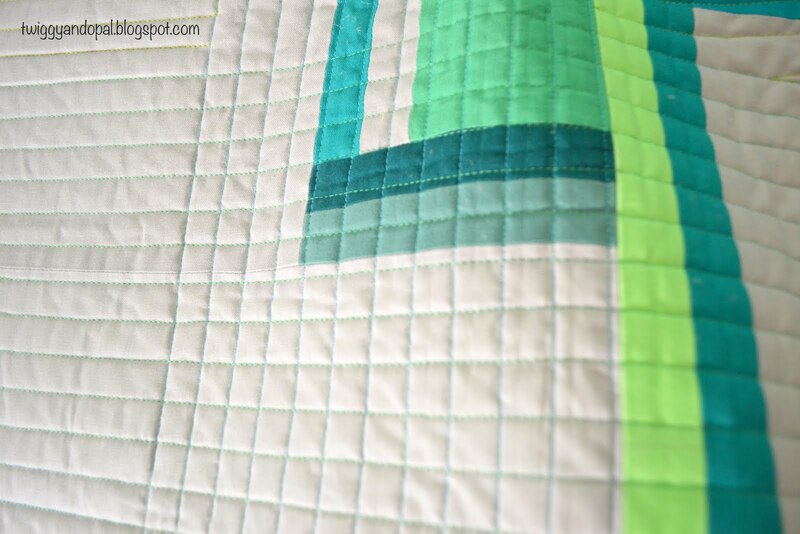 I used Aurifil 50wt Light Emerald #2866, Bright Turquoise #5005 and Spring Green #1231 for all the quilting. It felt right to use a few different colors, but not too many. The fine line was drawn at three. 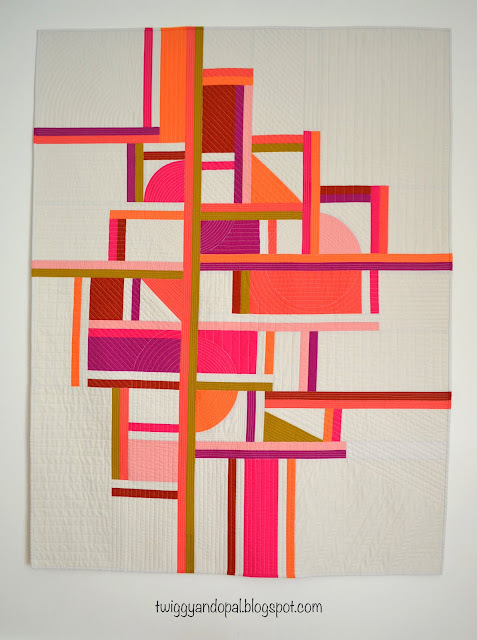 I had a plan when I started, but it quickly proved to be far too much for me and this quilt. Which is weird since I've done it before. For some reason it didn't want to take hold and I ended up grabbing my seam ripper...twice! In the end settling on 1/2" lines instead of the original plan of 1/4" lines. One thing that stayed steady was having a curve element in the quilting. With this design, I tend to work off the Drunkard Path blocks as the beginning of the curves. After that it's whatever the quilt wants. Strange, I know. It hasn't failed me yet, so I'll continue to work that way until it tells me otherwise. Grids, curves and a straight line section here and there. I keep telling myself simple isn't a bad thing and maybe I should do that instead. Then for one reason or another it ends up like this. Mind you, I'm not complaining especially after seeing the results. 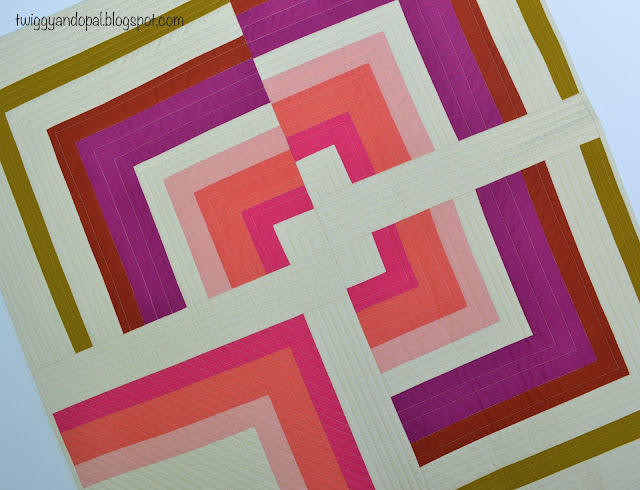 Can I say I long for the days when I would quilt simple and not so dense?! Then again when I did that I'd wish I quilted more detail! It is what it is! 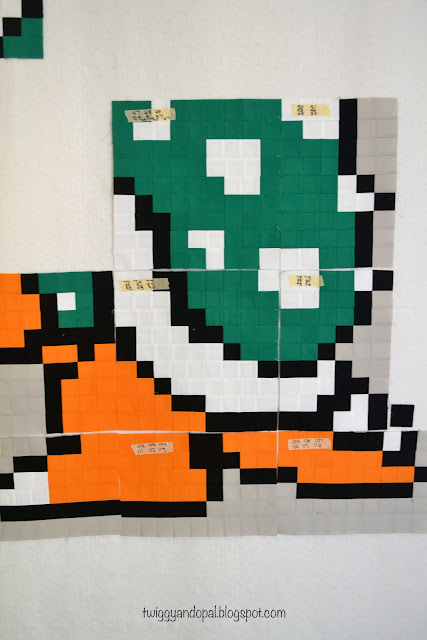 Part of the design created this grid. I wasn't expecting it at first and was delighted when I saw it starting to happen and come together. The back ended up being pieced together using some of the colors from the front and finishing it off with a Jade Green binding. I was tempted to match the binding like I did on the original quilt design. Maybe that was the area where I subconsciously kept it simple! 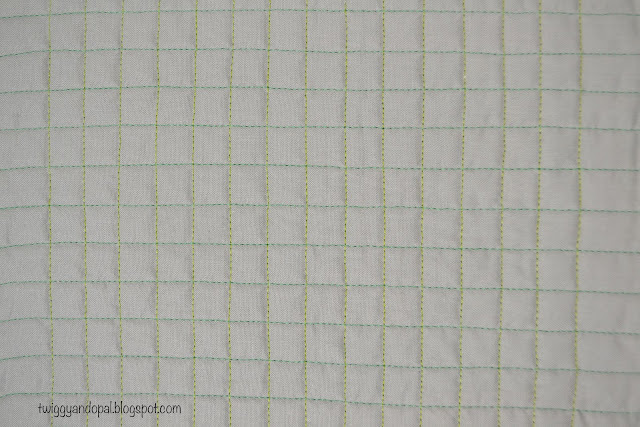 A close up of the grid shows two different thread colors and would you look at that?! It looks almost perfect! You know how it can get trying to keep things straight...it doesn't always happen! 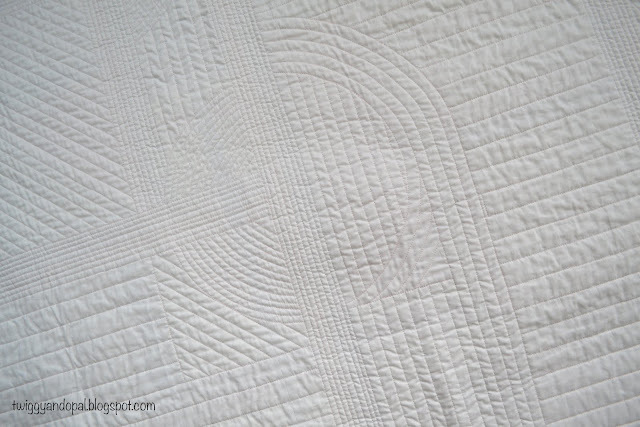 There are always inaccuracies when it comes to quilting. 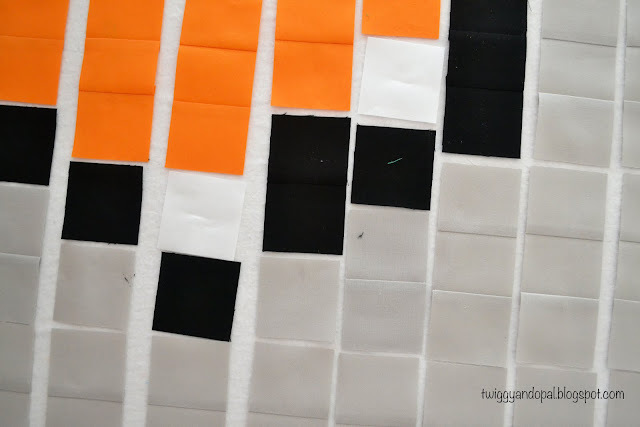 I tried to keep my lines as straight as possible while quilting on my domestic machine, as well as keeping the lines straight with the rectangles or strips of the design. But honestly, as hard as we try (or maybe it's just me) nothing is ever perfect. 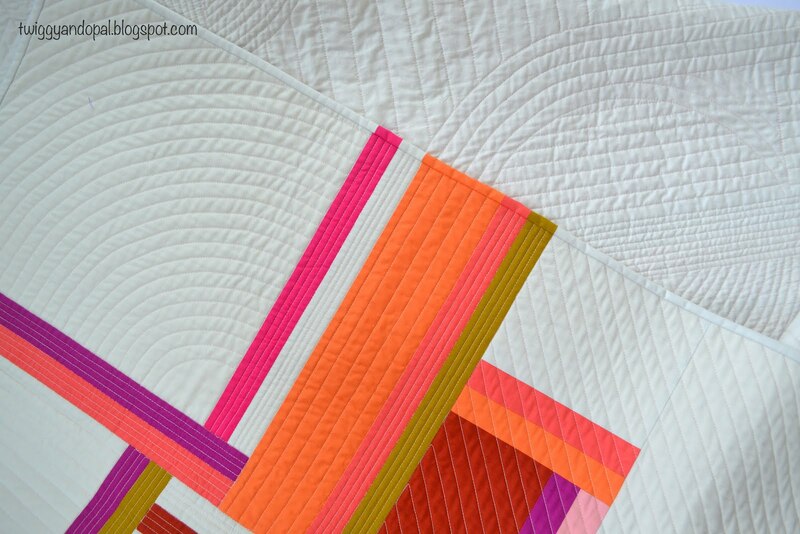 So we adjust our quilting by adjusting our widths and lines. Always in hopes of making it better or perfect or good enough. 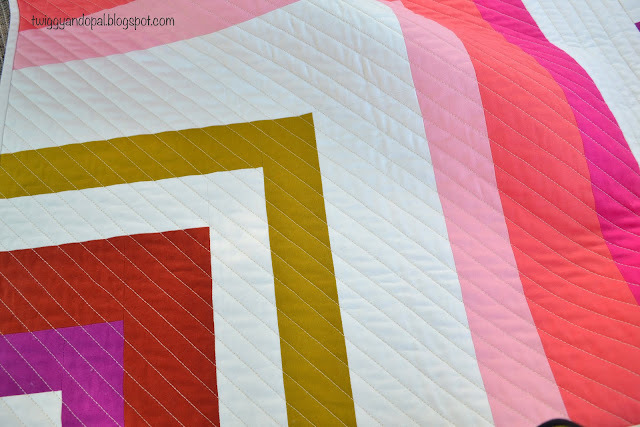 You would be right if you think I'll be making this quilt again! I rarely make the same design twice. But the possibilities are endless with this kind of design. My mind goes crazy with color combinations. Believe it or not, I'm seriously considering a muted palette for the next one. What color combination would you like to see?! First off, this is not a quilt I'll be entering at QuiltCon! I'm quite sure it doesn't fit the 'modern' criteria! Second of all, a theme quilt isn't my usual thing. 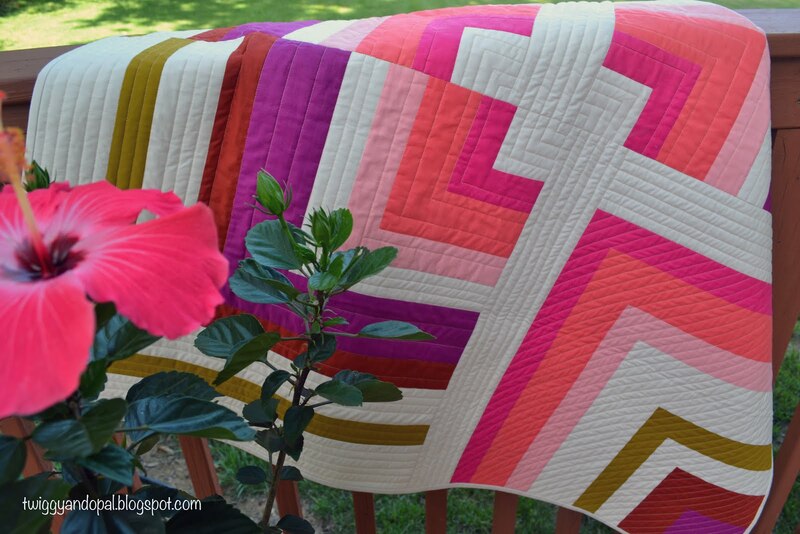 If you saw a picture of this quilt you would never guess I was the one who made it! Thirdly, I was so not looking forward to making it. But the second I started I was so stoked and excited. I didn't want to stop! Let's back up! 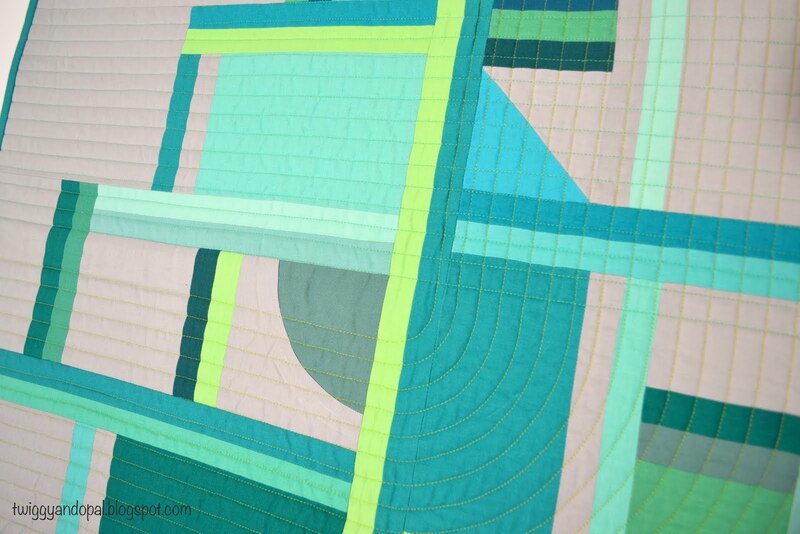 I've been laser focused on completing quilts that can be entered in shows...mainly QuiltCon. Much of the stress is bought on by not knowing if they will even be accepted, let alone if they are up to par with other quilts. I haven't entered any yet, but I'm on the backside of finishing what needs to be done. Which left me with free time and a desire to let loose and have fun! You know, let off a little steam! 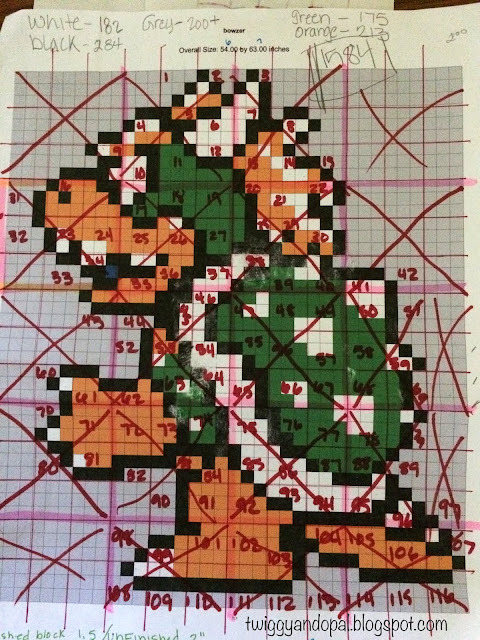 I told my daughter that I wanted to make a Mario quilt for her god-son for Christmas. We don't have grandchildren, but this little guy and his sister are what we lovingly call our surrogate grandchildren. Anyway, she said why wait until Christmas, his birthday is in November! And, he would rather have a Bowser quilt than a Mario quilt! Well, okay! Searching for pixelated images was the easy part! There is a million and one out there and any would be usable in a quilt. 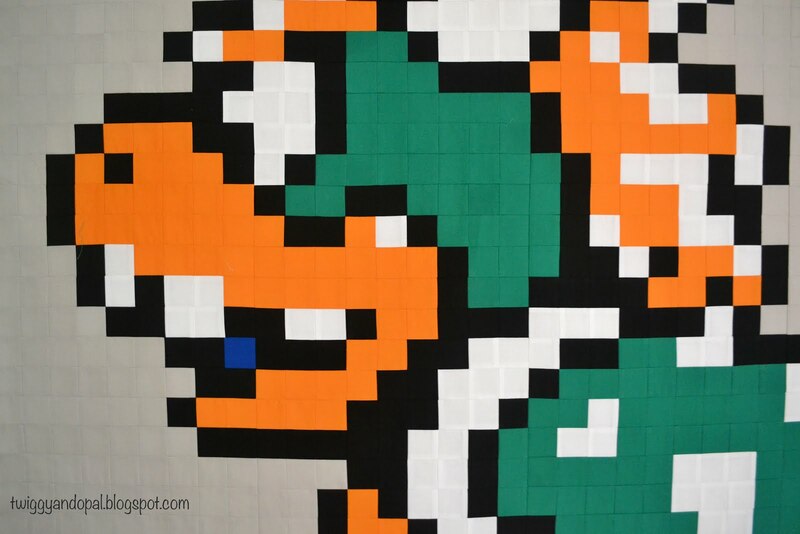 It doesn't have to be Mario themed, it can be any pixelated art. 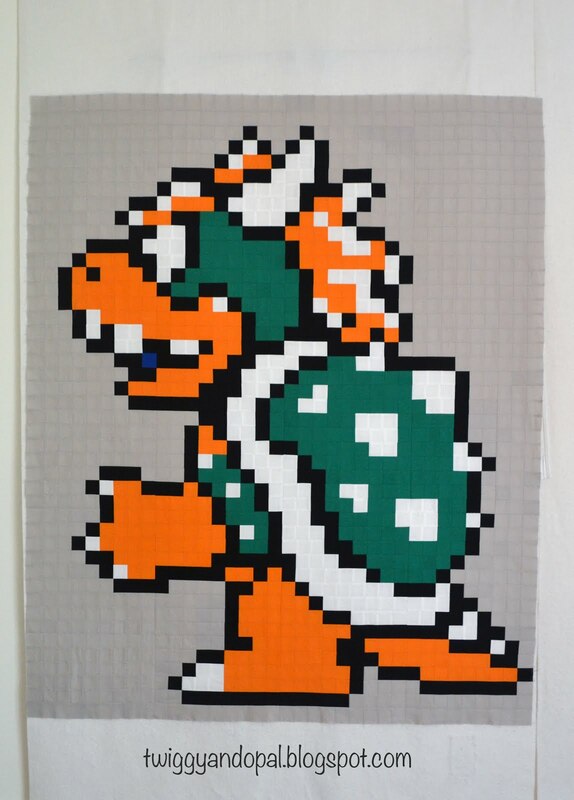 The only other time I made a pixelated quilt was this one: Pixie Ghost. Think cross stitch! Did I say I wasn't thrilled with piecing this?! 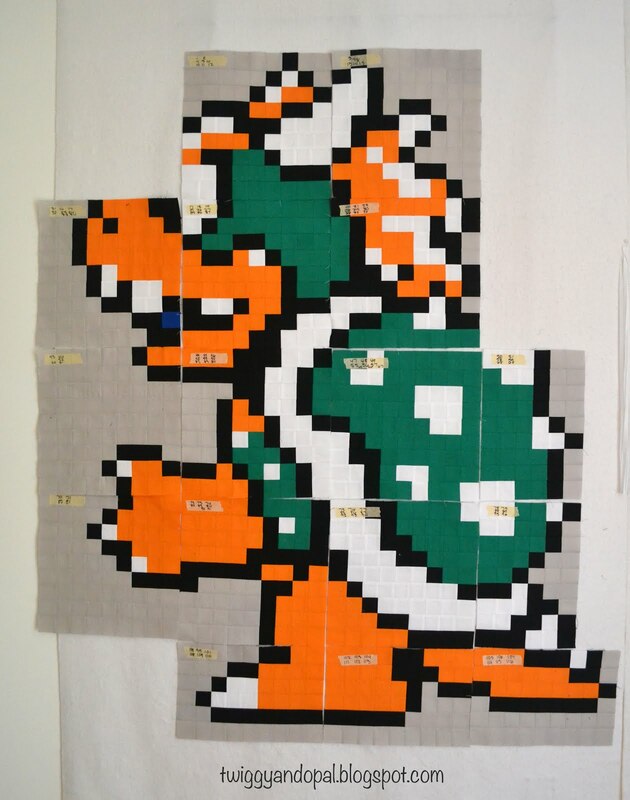 I did the math and figured I would need 1512 squares. Right?! When I saw that number I was certain I had lost my flipping mind and bit off more than I could chew...or wanted to chew. Let me give you the details. 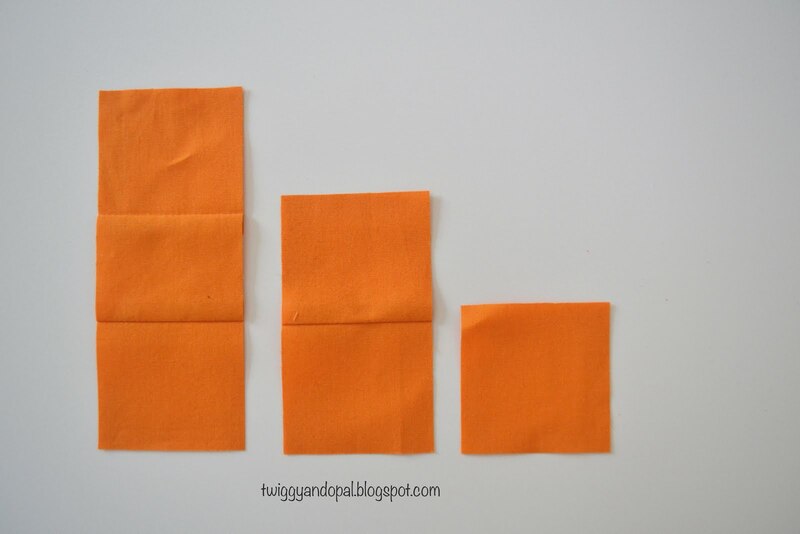 The squares were planned at cutting to 2". That means the finished size would be 1 1/2". The quilt would finish at 54" x 63". In the end I added two more rows to the top which increased the size to 57" x 63" and the final square total...1584! I made a test block. A 9-patch test block. So, okay...I can do this. But the trick would be getting all the seams to nest from block to block. That evening I calculated, figured, thought and was sure I knew what the plan was. Seriously, 9-patch blocks...that would mean I'd need like 180. Sleep on it. Maybe there would be an elf that will get them done by morning! That didn't happen, but I did have a fresh outlook and a new plan! 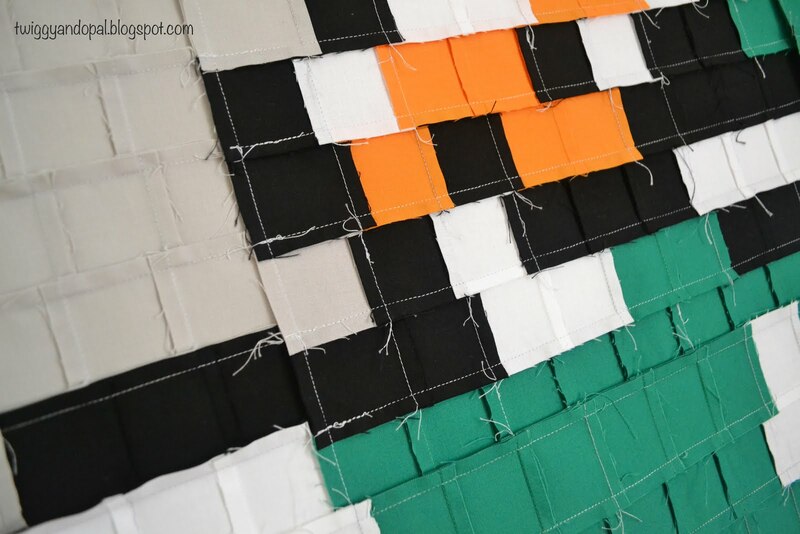 Instead of 9-patch I'd do 81-patch blocks! If that's a thing, I'm doing it! This way I can have each row pressed in a different direction for the nesting effect. Which is crucial in a design like this. And, I was able to figure out how each seam after the rows went together would go...it's all about nesting! Another important key to a design like this is chain piecing. I figured if I had units of one, two and three squares I could tons of save time. Strip piecing and sub-cutting are your very best friend ever with a quilt like this! I cut 2" strips from the width of the fabric (WOF) in the five different colors. However I cut the WOF in half before sewing the rows. I figured I'd have a better chance of keeping the fabric straight and it would be easier to work with. I pressed the seams to one side and then sub-cut 2" sections. The process was quick and efficient. I was ready to begin the real work...doom, despair and agony...or so I thought! As you can see from my chart, I wrote numbers for each main 9-patch block. After which I drew lines for the '81-patch' blocks that I would make one at a time. I picked a block and laid out my squares. It made it so much easier with the 3, 2 and 1 units! 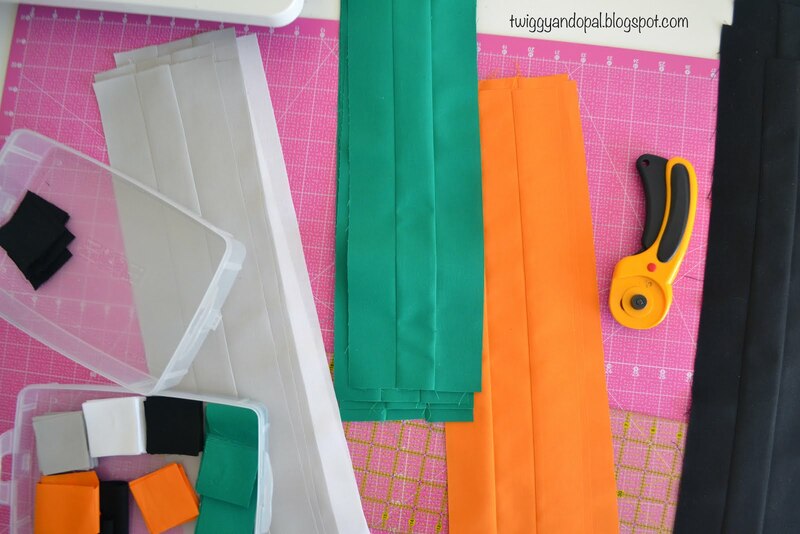 I grabbed what I needed making sure the seams were going in opposite directions in each row. 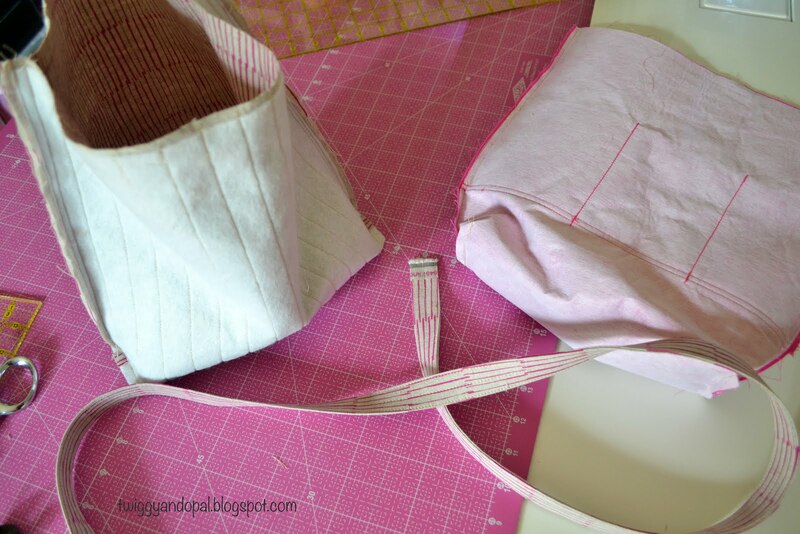 I would sew one row at a time, press the seams in the direction needed and then sew the rows together. The other thing to keep in mind is which way your press your row seams so that they nest with the other 81-patch blocks. Piece by piece, block by block it all came together. I could see Bowser unfolding before my very eyes! Seriously I was getting psyched! More, more, more! The blocks were lining up, the pixelated action was happening, I am reluctant to say it, but I was enjoying this probably far more than one should! I should also mention that I cut my teeth on Mario gaming. Maybe not exactly... Atari Pong was really my first but I didn't want to date myself...too late I guess! And Vincent, who this quilt will belong to loves, loves, loves Mario and it's going to be his 5th birthday. So, something special was in order! Back to the quilt. Maybe because it's something out of my norm, or maybe because with each block seamlessly fitting together, I could not stop! It did take four days of piecing but it was fun. Just plain and simple fun! I want more...I wanna do it again! Maybe Vincents sister will love Mario too and for her 5th birthday I can make Princess Peach! Close up isn't quite as good as far away when viewing this quilt. I get it, I get the pixelation and the concept of Bowser. I didn't think I'd really get it done by Vincents birthday, and even enlisted in to bribing for my daughter for help. Not needed! She was willing, and even she was blown away by the quilt and how fast it came together! As much as I would have loved to have her making quilts with me again, I just could not stop! Here's a picture of he back seams. It ain't pretty, but it does show you the nesting factor. To me I think it might be the most important part of making a pixelated or postage stamp quilt. 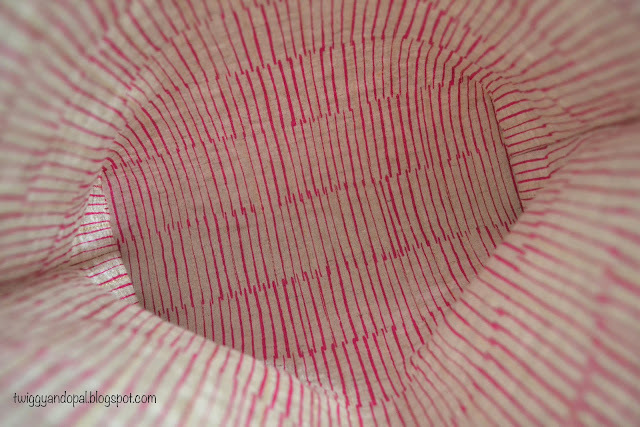 It really does make lining up the seams so much easier. I won't say this is a perfectly lined up quilt. I doubt I could ever achieve perfection. And it really isn't the point of this quilt or any quilt for me. I just loved making it! It's so out of character (no pun intended) for me. It's nice to change it up once in a while regardless of your style or comfort zone. 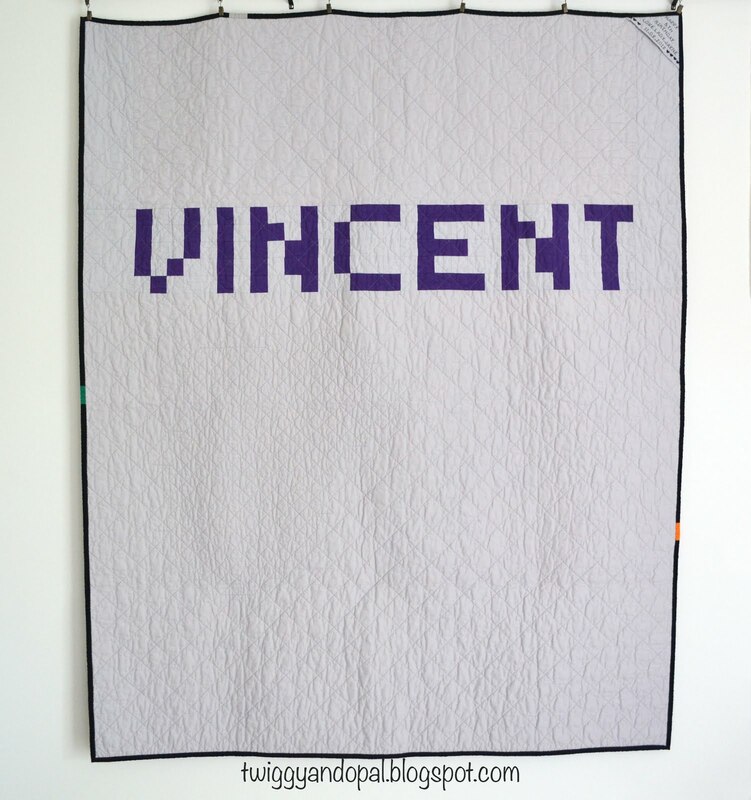 I plan on making a pixelated strip for the back with Vincent's name and then prepping for quilting. I'm not sure how. Maybe diagonal lines which would be easier and better than stitching in the ditch! 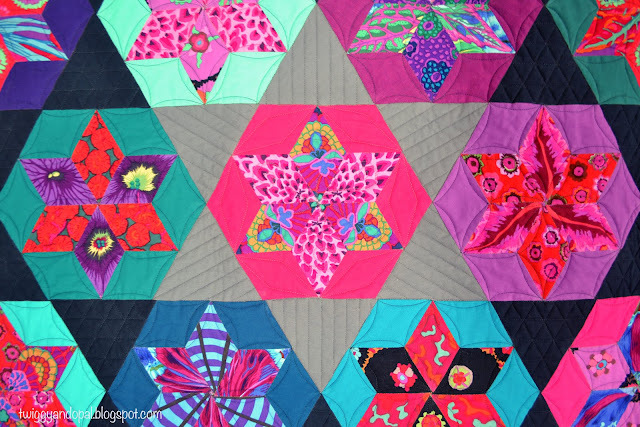 How would you quilt it? Hopefully in another week or so I can make the final decision! Cross Body Bag :: As Simple As It Gets! 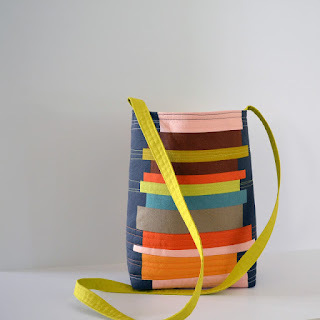 Before you get too excited, I do not make bags. 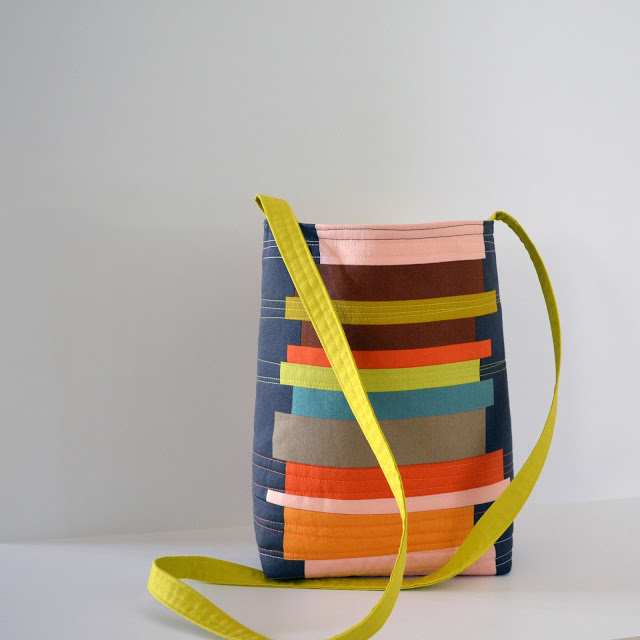 I do not enjoy to make bags. I find making bags beyond my capability and frustrating. Other people can whip up gorgeous ones that blow my mind and I love seeing them. They just are not in my wheel house. I do however have one bag I make that suits me perfectly. It's as simple as it gets, which is all I need. 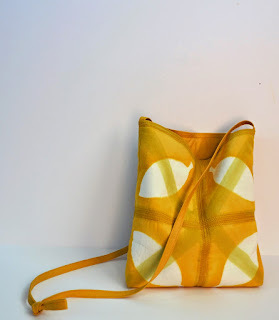 Small in size, a three section pocket and a long wide strap that I can fling across my body. My current bag has served me well. Over time it has become a shabby worn out tattered and very sad looking accessory! I knew one day I would make another, and hallelujah! that day finally came! While waiting for my big sewing machine to come home (it has since returned), and being in between projects, I figured it was the perfect time to check it off my list. Since I had been thinking about this for a long time, I already knew what fabric I was going to use for this one. 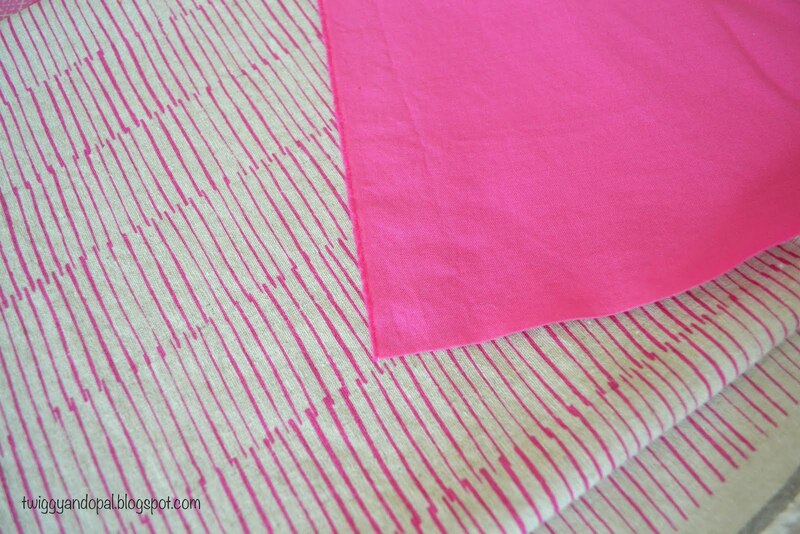 With pink being my current favorite color, I decided to finally use my Maker Maker Lines fabric for the outside. It's has the pink I want, yet subtle and is a linen/cotton blend. 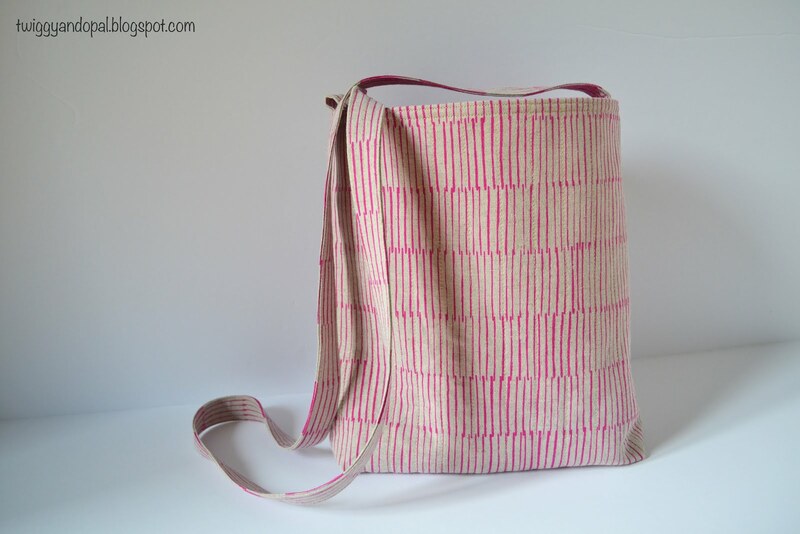 The lining is Freespirit Fuchsia. It's a good combination for me! 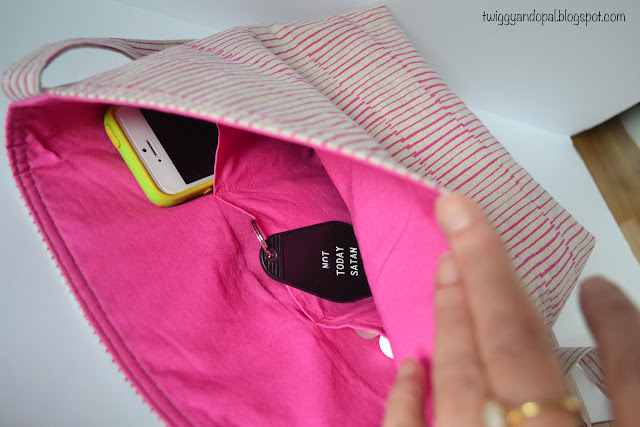 I used a fusible fleece on the outside and a medium weight fusible interfacing for the lining. As you can see the basic construction is so simple! Think fabric baskets, but tall and skinny! Outside, inside...plop together...sew...turn...viola!! You got a bag! I will say that I don't make these often or make fabric baskets often, so I have to think very hard when it comes time to assemble! The pocket is simply a folded over piece of fabric that goes from side to side and has three sections. One for my phone, one for my keys and one for my lip balm! That to me is the most important component to me. I thought I'd share the other two bags I made. The first is a fabric my daughter made for me. 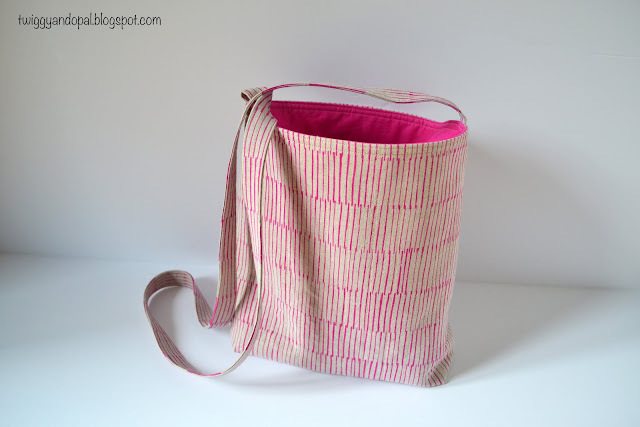 The second is a Home Dec weight Anna Maria Horner fabric. I actually covered my dining room chairs in that fabric. With each version I make the only difference is the strap becomes wider! I guess it's a comfort factor! Thought I'd add a fun shot of the outside before I turned it! Now I have a new bag to drag through the mud...so to speak! I'm sure I'll be posting in another year or two about the fourth bag in what has become a staple in my life! I discovered today that yesterday was my 5 year Blogiversary! How did that sneak up on me?! I never would have thought 5 years ago that I'd still be doing this. Heck back then I didn't think I had anything to say or share let alone think anyone would actually read it! I sincerely love blogging! It has opened my world! I am so thankful to all of you who have read, commented, encouraged, inspired and keep coming back for more. Thank you more than I can put in to words. 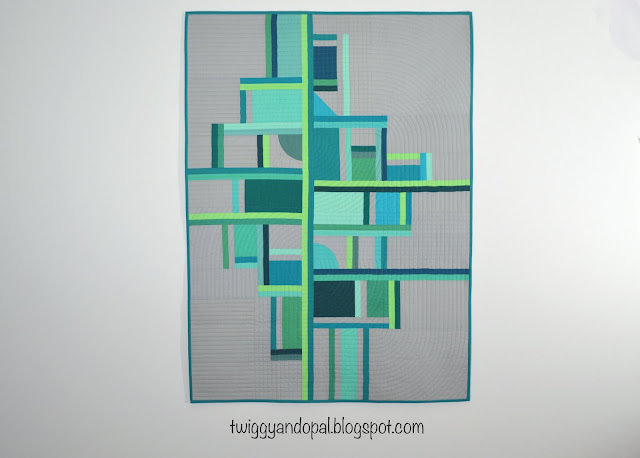 I love happy quilts! This is a happy quilt! Happy because the design was everything that I had hoped it would be, I was able to use colors that I love and the quilting was intense but perfect to me! The top was finished a month ago (Geometry Lesson Process), but I wasn't ready to take on the task of quilting it at the time. It sat for a while, not for lack of quilting ideas, I knew without a doubt I'd be doing straight lines of some sort. 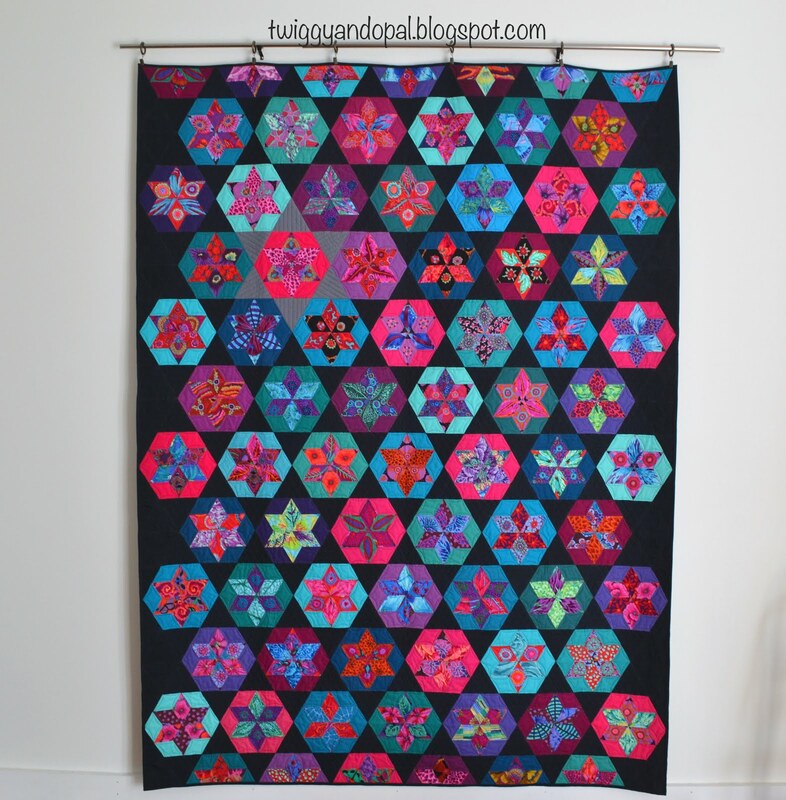 I needed to wait until I could fully commit and focus on just this quilt. There was a lot of seriousness involved! And a lot of flying by the seat of my pants! I tend to take sections and quilt my idea until it's finished and then move on to another section. The basic idea is there, but nothing is set in stone or planned ahead of time. I used three widths of lines: 1/4", 1/2" and 1" lines. Diagonal, horizontal, vertical and curved. I choose to use a Pale Pink (#2410) 40 wt Aurifil thread for all the quilting. You can't really tell it's pink from these pictures, in person you can. Before I started quilting I debated matching thread color to the fabric, but quickly dismissed that idea...although I did want to! 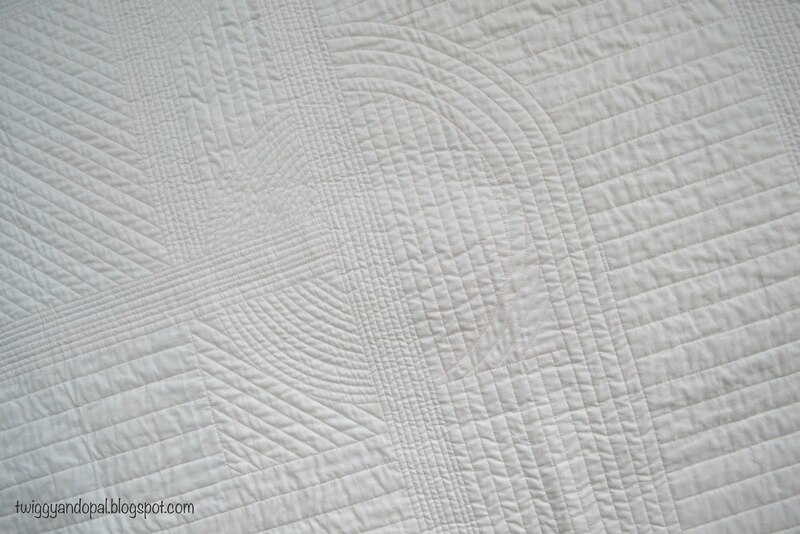 The curve of the Drunkards Path block was continued into a circle and extended with straight lines across the quilt, or a full circle with different widths of lines. Anything goes! I found it to be quite effective and with each section, I was excited to see what I could do. Usually when it's time to quilt I get impatient and just want it done! By then I'm usually ready to move on to something else. This time was different. I took a lot of deep breaths, reminded myself it wasn't a race, and focused on trying to be as accurate as possible. That's not to say it is perfect because it certain is not. But I tried! It was weirdly satisfying to have that much focus and determination. Perhaps it's because I'm proud of myself for sticking with it or because I absolutely love how it turned out. 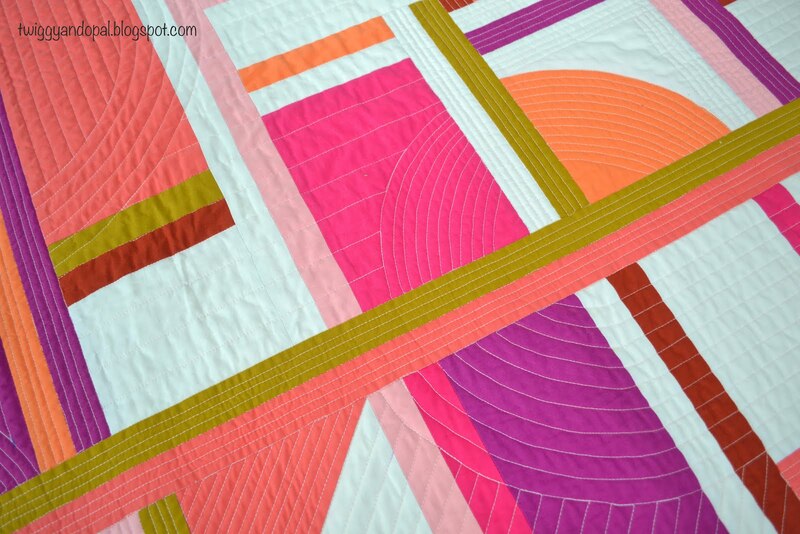 It isn't easy to quilt a complex design on a domestic machine. 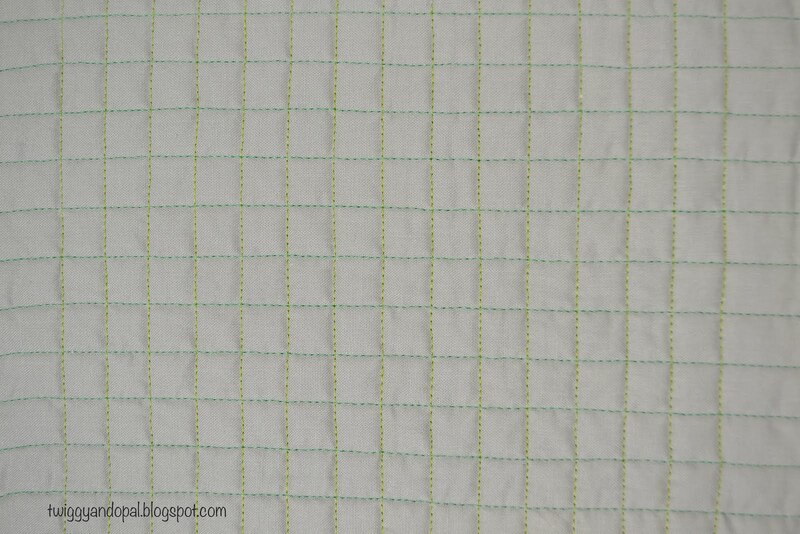 On the back you can see the different widths and directions of some of the quilting. 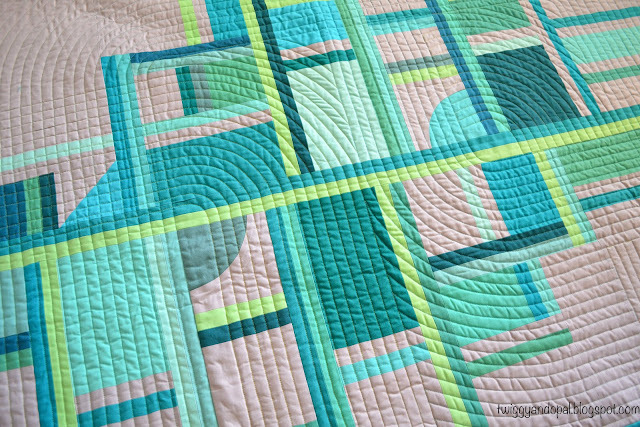 If it wasn't for the fun geometric front of the quilt, I wouldn't have ever thought about quilting a design like this! After putting my heart and sole into the quilting, I wasn't ready to go the easy route on the binding. I decided it was worth the time to make a matched binding and extend the design to the edge. It wasn't easy! And it isn't perfect! But I do love it! After I finished quilting and binding this quilt I took my big machine in for a tune up. I have one more quilt I'm anxious to quilt and can't do it with my pride and joy! 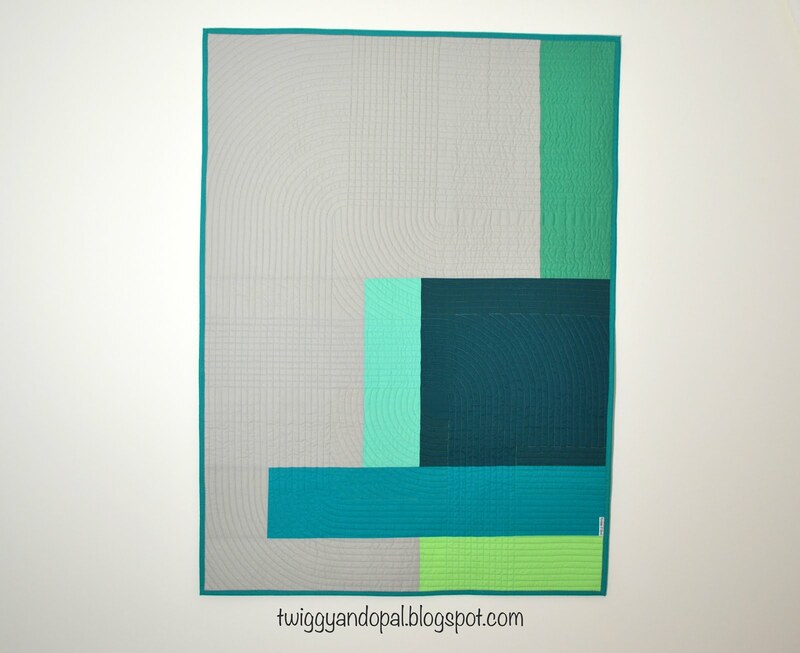 Next up...a baby version of Geometry Lesson if gorgeous aqua + teal + blue + green + grey! Any day now...any day! 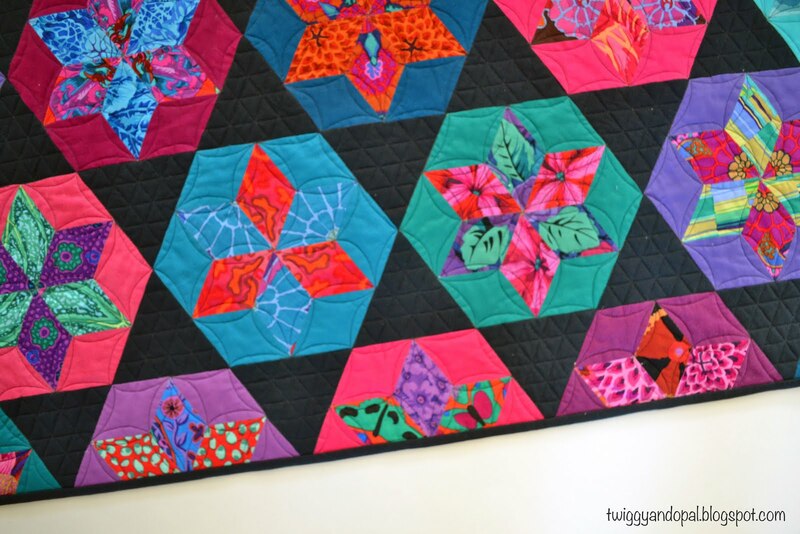 How do you make yourself focus and take your time when quilting? Deep breaths, swearing, a glass of wine? !